So, woke early this morning to an overcast sky. By the time my coffee was ready, it was raining... gently this time. :) I sat in my living room by the window in the quiet and just enjoyed the warm coffee, cool room and falling rain. Now I'm trying to decide what I want to tackle today... my closet, perhaps? That will be a huge undertaking and it's overwhelming every time I go in there to begin. My closet is basically a 12x12 divided room and it's packed. What will be most difficult is the purging. I have tons of clothes I can't wear. Too small. But they are things I used to wear before this last gain. I should get rid of them, but it's so hard!!! I'm with you. I need to do SOMETHING about my clothes but I never can. 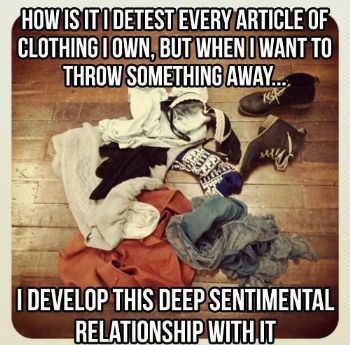 I have the same problem, except my closet is tiny. I have way too many clothes and I always say I'm going to get rid of things I haven't worn in a year, but then when it comes down to it I'm like "but I might wear it". I hope you had a good day, whether you got your closet done or not. I HATE cleaning out our closets. So, I have devised a plan. If it hasn't been worn over the past year, it is out. Unless it is formal wear that doesn't get worn a lot but would be expensive to replace. Best wishes! It's really funny...but my clothes are the easiest thing for me to pitch. It's my books or furniture projects I want to rehab that trip me up. I just envision the new owner with a big smile on their face and how happy they will be with my stuff and that spurs me on. Keep at it...a little bit at a time de-clutterering is terribly freeing and I think it actually encourages weight loss! Pretend you are moving to a much smaller place with a much smaller closet. What items could you absolutely NOT live without? Keep those and toss the rest. We are actually moving to a much smaller space and I am in the process of this right now. A friend who is very good at organizing her stuff tells me that she just goes through a bit of her closet at a time, asking herself if she would buy each item at full price right now today. If the answer is no, it gets donated. I haven't tried it yet. Just one thing at a time. Good luck! Maybe start by separating them into categories? "I love this", :"I like this", "this is okay". Start by giving away the "okay". It's a start. If you keep it going, by the time you can wear the clothes again you will be down to the "I love this" outfits. It sounds like you'll still have plenty to wear! an accomplishment after we tackle a job like that,you can do it!Love the sound of rain falling. I am a coffee lover!Hope you enjoy your weekend! You'll feel much happier once the closet is done. As for the clothes that are too small, perhaps keep one outfit as motivation.